Matthews Wall Anchor has years of experience in commercial foundation repair for structures in New York. 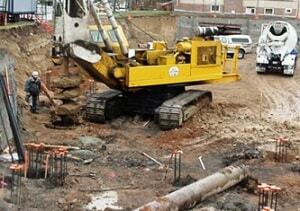 We use piling, underpinning, and shoring solutions to repair new or existing structures. We stabilize retaining walls, uneven floors, brick and sheetrock cracks, and other structural issues. We have fully trained staff, including structural engineers, to identify the source of your foundation issues and determine the best repair solution to protect the ‘skeleton’ of your building. We’re your commercial foundation repair experts for the New York area. Let our structural repair experts provide you with a free consultation to discuss any structural issues that you have. We can visit your location and inspect the structure of your building. Our staff is fully trained and certified to handle all of your commercial foundation design and engineering needs. Matthews Wall Anchor offers piling solutions such as helical piles and augercast piles. These piling solutions are designed to support bridges, buildings, towers, and other structures. Underpinning involves strengthening the foundation of a building or structure. Some foundations become weak due to wood rot under the foundation, structural changes, poor soil conditions or soil compaction. To support weak foundations, we use underpinning solutions. Piers are load tested during load transfer and attached to existing foundations with a bracket system. Underpinning can stabilize the foundation for many years to come. Shoring is used to repair new and existing retaining walls. We offer plate anchors to stabilize and support cracking and bowing walls. Plate anchors use handheld equipment that requires minimal excavation to the work area. Another shoring solution is soil nailing. Soil nailing can be used to support tunnels, garages, sheds, buildings, and weak retaining walls. Earth Contact Products (ECP). ECP is the leading manufacturer in underpinning. Contact us today if you need quality, professional service in New York.